Giovanna Cecchetti’s works of art echo her investigations into space-time patterns, quantum physics and non-local theory. While Cecchetti’s process of making art incorporates a personal meditative practice and attention to detail, the subject of her abstract paintings and works on paper explore themes concerning the spiritual, sacred geometry, patterning, visual sound, and spatial dimension. Giovanna Cecchetti was born in 1953 in Suffern, New York. Cecchetti initially studied art at SUNY Rockland under Edgar and David Levy, whose influence brought her to NYC in 1973 to study with Larry Rivers, Elaine deKooning, and Jane Wilson at Parsons School of Design. In 2003 she received an MFA from William Paterson University where she recently taught Contemporary Color Theory as an adjunct professor. Cecchetti’s studio is currently located in California. Cecchetti is an awardee of the 2011 Dave Bown Project grant. 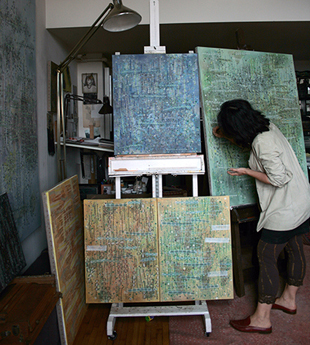 She is a recipient of a fellowship in painting from the New Jersey State Council on the Arts and a Rutgers Center for Innovative Print and Paper Residency Fellowship (Brodsky Center), as well as funding from the Adolf and Esther Gottlieb Foundation, and Artists Fellowship. Cecchetti has been awarded residencies at Wild Acres, Little Switzerland, NC (2013), a Mid-Atlantic Arts Foundation Creative Fellow for a residency at the Millay Colony for the Arts (2010), and a Geraldine R. Dodge Foundation funded residency at the Vermont Studio Center (2004). Cecchetti's work is included in public, corporate, and private collections both national and international.